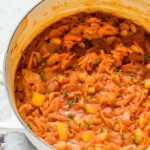 Chakalaka is flavourful and so easy to make. To a pan over medium heat, add the oil. Then add onion and sauté until translucent and softened. Add garlic, ginger and curry powder. Stir to combine. Add peppers. Cook for 2 mins. Add carrots. Stir to combine and ensure they’re coated in curry powder. Add tomatoes and tomato paste. Stir to combine. Cook mixture for 5-10 mins. Mixture should be well combined and thickened slightly. Add baked beans and fresh thyme. Simmer for 5 mins. Remove from heat. Can be served hot or cold. Adapted from this recipe by Chef Siba Mtongana.